David Wells, March 12, 2010. Photo by Jim Grant. 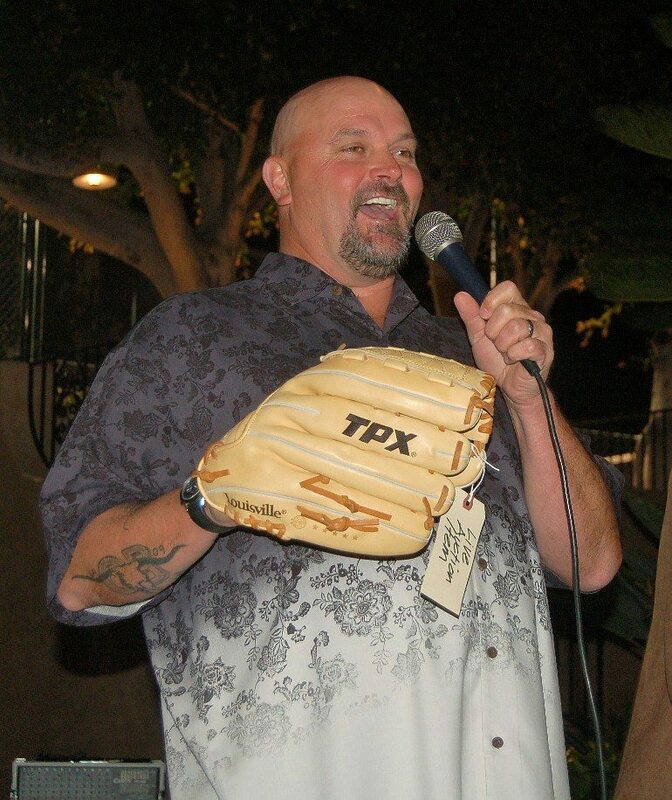 On March 12th, the Point Loma High School Baseball Booster held a benefit auction where David Wells, the major league pitcher and member of PLHS Class of 1982, brought in LOTS of his personal items to be auctioned off. Jim Grant reported that the event was attended by 200 or so people, and that about $20,000 was raised. That’s incredible. David Wells, probably the most-famous OBcean, also displayed a tat that betrayed his upbringing. Check it out on his right forearm. That’s the logo of the OB Longhorns – one of the longest standing OB “gangs.” Here’s our recent post on Wells. The Friends of the San Diego River Mouth need volunteers with an interest in helping to save and restore one of the last remaining Coastal Dune and Wetland Habitats in San Diego – on Saturday March 27th. Despite the recent OB Town Council forum on homeless youth, we are still receiving complaints both about the traveling youngsters and complaints from them about people abusing them. Businesses people are still chaffing at the open use of weed in and around the OB Pier. Homeless travelers are also complaining of how some businesspeople and others harass and abuse them. At the Town Council forum, the San Diego Police representative said the police treat everyone the same. So, the OB Rag urges homeless people to make complaints to the police when their rights are abused or when they are assaulted. At the Town Council forum, the lack of available public restrooms was a big issue. Both the Council and the OB Planning Board committed that they would work on this persistent complaint. As far as we can see, no movement has been made on this issue. The recently formed San Diego Coffee Party is having its “Coastal” section meeting this Saturday, March 27th, at Java Jungle. The meeting is at noon. The Coffee Party – an alternative to the Tea Party movement – has exploded in the last 7 weeks. There are nearly 400 chapters nation-wide. The San Diego group met on the 13th and the turn-out was so huge, that it has split up into four groups. The “Coastal” group includes OB residents and others west of I-5. See here for recent posts. To the west, catering to the midweek clientele, is the Ocean Beach Farmers Market. Open Wednesdays from 4 p.m. to 8 p.m., the market’s proximity to this small beach community brings with it all of the eccentricities of the area. Lining O.B.’s main vein of Newport Avenue are booths stuffed with bright vegetables and blossoming tulips and carnations. Then, unexpectedly, patrons will find themselves surrounded by jewelry crafted from silverware, nuts and plastic. These are the creations of the town’s local artisans. The issue of the eight remaining fire pits in Ocean Beach is on the agenda of the Town Council’s monthly meeting in April. The Council will meet at the Masonic Temple at 7pm on April 28th. Supporters of the “Adopt a Fire Pit” hope the Council will pass a resolution against their removal by the City of San Diego. The City says they will begin removing San Diego’s 185 fire pits July 1, 2010, when supposedly the funding for their maintenance runs out. However, the Coastal Commission is holding to the position that the City must first submit the required permits to the Commission before the facilities are removed, and the City has yet to do that. Could ninjas be taking over Ocean Beach Pier? It appeared that way last Friday as uniformed motorcyclists screamed out onto the wharf and performed head-spinning wheelies, handstands and skids, then zoomed away. The performance, it turns out, was for a SPEED Channel taping. Sounds illegal and potentially damaging to our pier, which was just recently reopened after the damage from that last big storm. I sent Diane an email asking for more info. Kathleen Blavatt's winning sunset over OB Pier - 2009. Get your cameras out. It’s that time again when the OB Historical Society holds their photo exhibit and contest – “OB Exposed.” The exhibit and contest is open to all ages and levels, and any photo – old or new – color or black and white – is acceptable. The photos must be taken in OB or Point Loma. By May 13th, you must submit your photos to James Gang Graphics at 1931 Bacon, (9 to 5, M-F). All photos must be matted or mounted on card stock or other art paper. There is a form to fill out and a $1 entry fee. Last year‘s event was a wonderful display of photos of OB. There were so many winners and photos of OB’s most famous image – the Pier – that it has been suggested that the contest have a special category just for pier photos. Pier was blocked off with SDPD…all legal and legit. Kathy Blavatt won Best Special Effects. If you carefully read the bit about OB’s Farmers Market, the market is actually the “favorite” of a patron being quoted. Electric Music Studios has opened for business inside Ocean Beach’s famed Electric Chair Salon. The new rock ’n’ roll academy, designed for children ages 6-18, will be performance-based with private lessons and weekend band rehearsals with students who will also perform live concerts. on a sad note, today the winter shelter was closed. so we have even less resources in the county for homeless folks to lay their head at night. Hey, writer. I just noticed my article from The Aztec was cited here, but I and the paper were unaware.